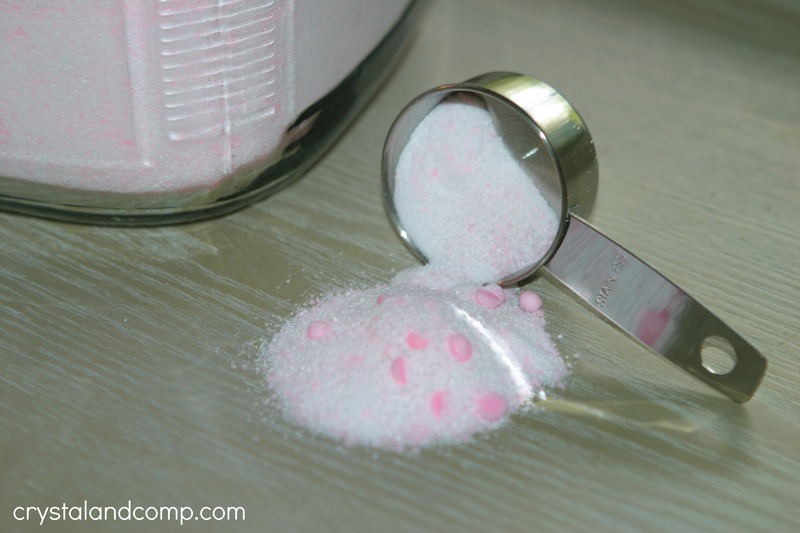 I have entertained the idea of making my own homemade laundry detergent powder many times. 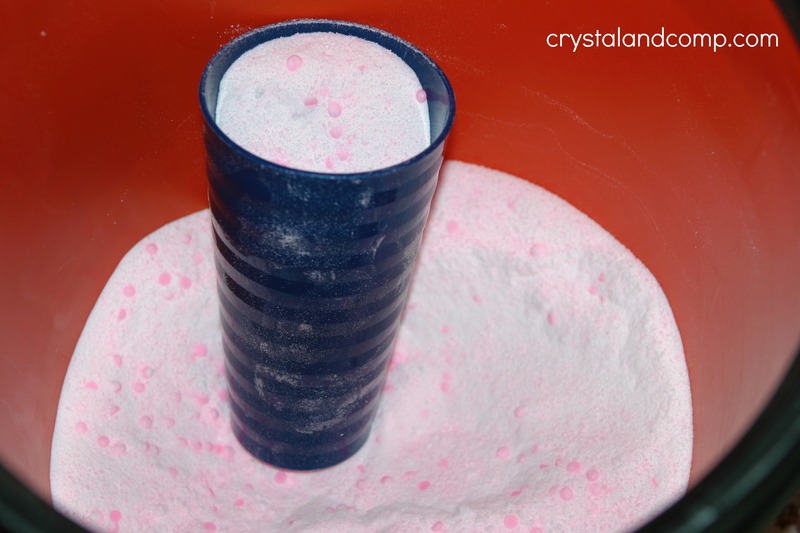 I have seen many tutorials that show how to make your own homemade laundry detergent that is powder and HE friendly. 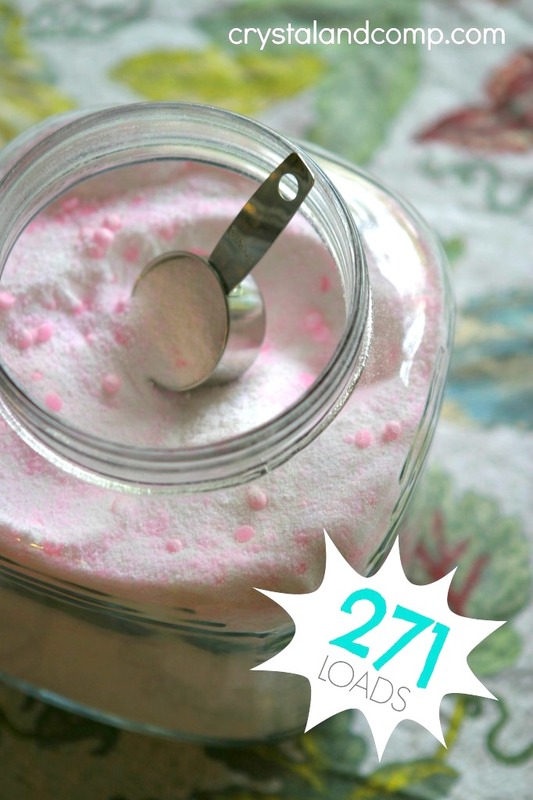 It certainly makes sense from a budget standpoint- it costs less than $27.00 for me to buy the ingredients and this homemade laundry detergent recipe will get me 271 uses! That is $0.10 per load, mama! I have told you many times that I hate my front load washer. It is only 4 years old and is a nightmare. It gets clogged. It throws errors. It leaks during every single load. I will never buy one again. I am waiting for it to die so I can go back to a top loader. At the rate we’re going it won’t be long. Well, in the last few months it has been dropping the liquid detergent in clumps onto my clothes and staining them- badly. Ruining many shirts. 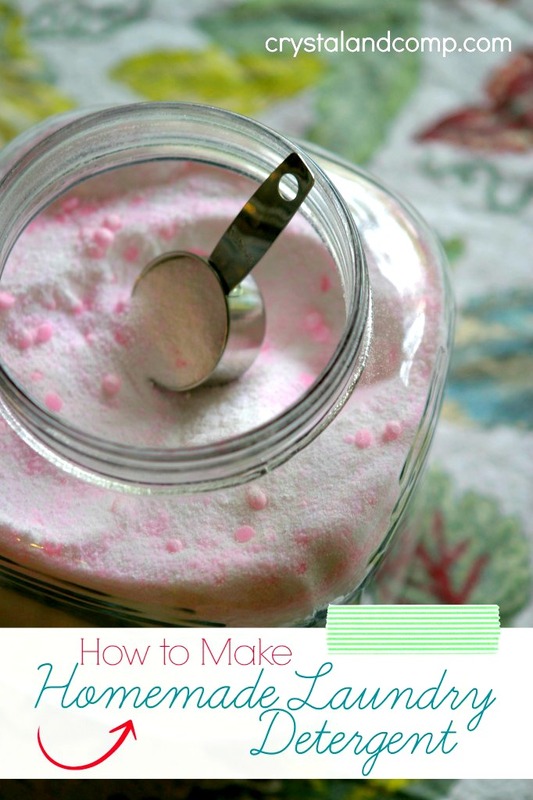 I am going to show you how easy it is to make your own detergent. And, you can make it a family event. You’ll defiantly want to pin this so that you always have the recipe at your fingertips! Take the Borax, OxiClean and Arm and Hammer Super Washing Soda and combine them into your 5 gallon bucket. All of these items are super fine, almost like a powder. Put the lid on the bucket and shake it up to combine. 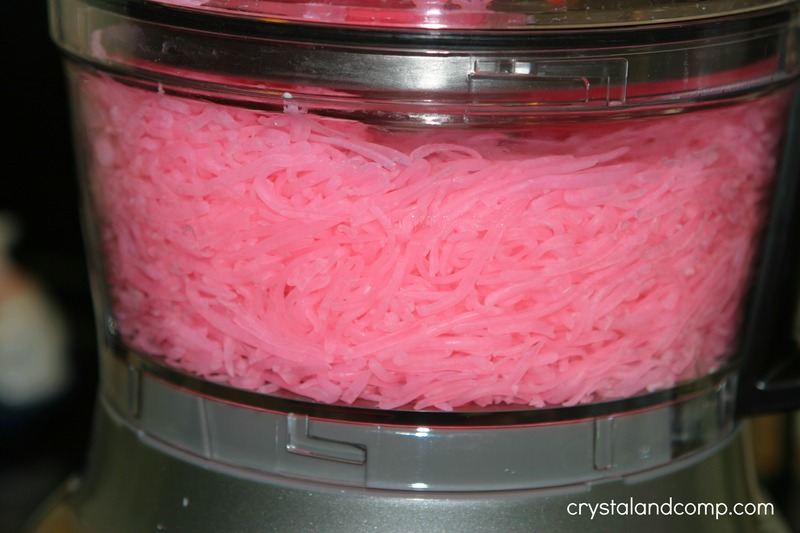 Put the shredding blade on your food processor. Take the two bars of Zote and cut them in half length wise. Put them through the feed tube of the food processor with the shredding attachment. You could also use a handheld cheese grater if you want to. Pour all of the shredded Zote into a bowl. Change the blade to the multipurpose blade. Put about 3-4 cups of the shredded Zote back into the processor. Pour about 1/4th of the box of baking soda over the Zote. Run the processor on high for about 1 minute or until it is super fine like the batch of Borax, OxiClean and Arm and Hammer Super Washing Soda. Dump it into the bucket of Borax, OxiClean and Arm and Hammer Super Washing Soda. Repeat the Zote and Baking Soda process until all of it is processed. 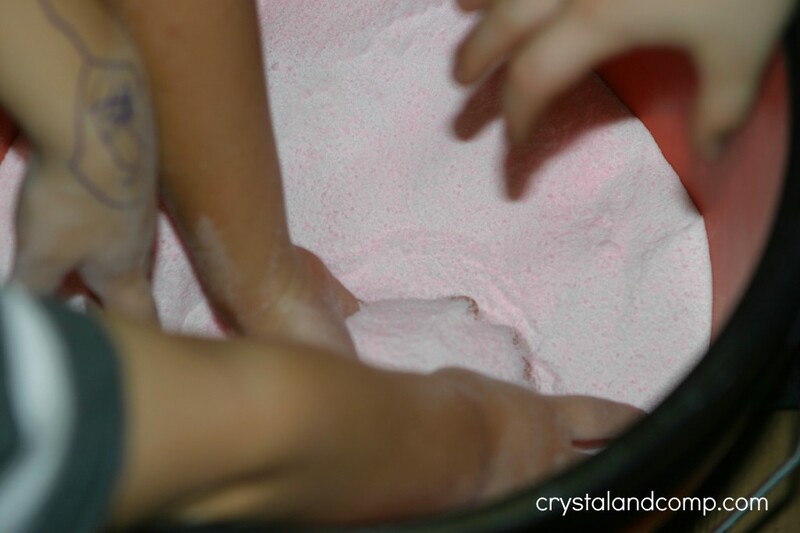 My kids enjoyed mixing the powders by hand as I added more Zote and Baking Soda mixture to the bucket. Add the container of Downy Unstopables to the mixture. Pop the lid on the 5 gallon bucket and shake, shake, shake until everything is mixed well. Use a cup to scoop the detergent up into an airtight glass container that you can keep in your laundry room. Store the remainder of the leftover detergent in the 5 gallon bucket. Use a 2 T measuring scoop, like a coffee scooper, as your measuring device for your loads of laundry. For each load add one scoop (2T) of detergent into the drum of your washer. This will allow you to do 271 loads of clean laundry. Here is what I am storing my detergent in that is readily accessible. The rest of the batch is still in the 5 gallon container. It cost less than $27.00 to buy all of the ingredients at Walmart. This full recipe makes 271 loads- that is $0.10 a load! You can’t beat that! If you struggle with clutter, merging blended homes, keeping your home clean and tidy, here is how we do it. I so want to try this but I’m scared to mess it up. Katherine- this is really super easy. You cannot mess it up! I am a step by step person that needs pics so I took images of each step so it is easier to follow along visually. Give it a try! You said to put this in the drum. If I have a front loader (which I love by the way) shouldn’t I put it in the dispenser? The first few months I just put it straight into the drum. Then another reader told me it worked fine when she put it in the dispenser so I tried it and all is well. Either way is fine. Initially I was just scared the detergent would get clogged. The smell comes from the fabric softener pellets that you add. I’ve done Unstoppables, Purex and others. Hello! I made this with the Tide Unstopables and it is WONDERFUL! I love this idea and have always wanted to try it…seems like it would save SO much and be so convenient! 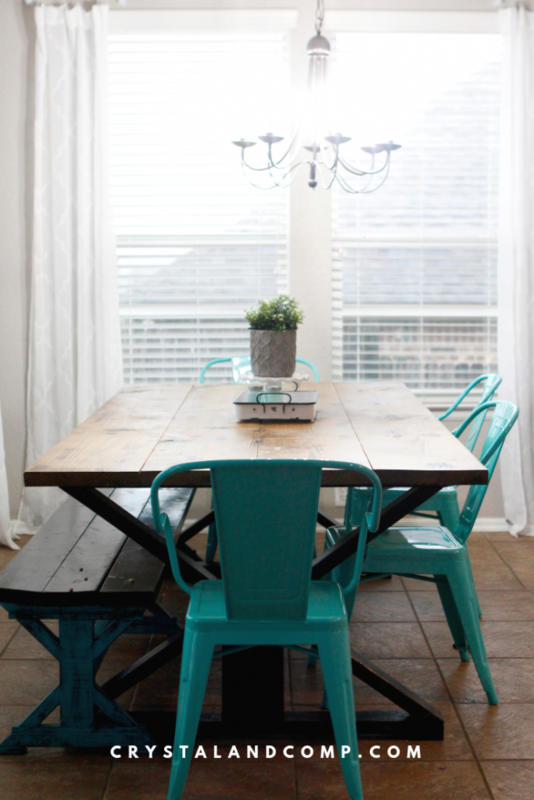 I would love for you to share this on Create It Thursday #20…it’s live now! Crystal — Great post! You’re featured at the Friday Flash Blog on The Jenny Evolution this week. Thanks for sharing and keep evolving. Yay! How exciting. Thanks for the feature, Jennifer! Tried this homemade detergent and it was AWESOME!!!! Thanks for posting it. This was my first time making homemade detergent and it was super easy! Loved it!! Yay, Sharon. That is so awesome to hear! The cup in the large orange container is for scooping detergent into my glass container. The glass container sits on my washer for each access. The orange container stores the mass of the detergent. The stainless steel coffee scooper that is in the glass container is 2T and that is what I use to measure for each load. Does that make sense? I don’t have a food processor but I do have the ingredients anything else I can use? 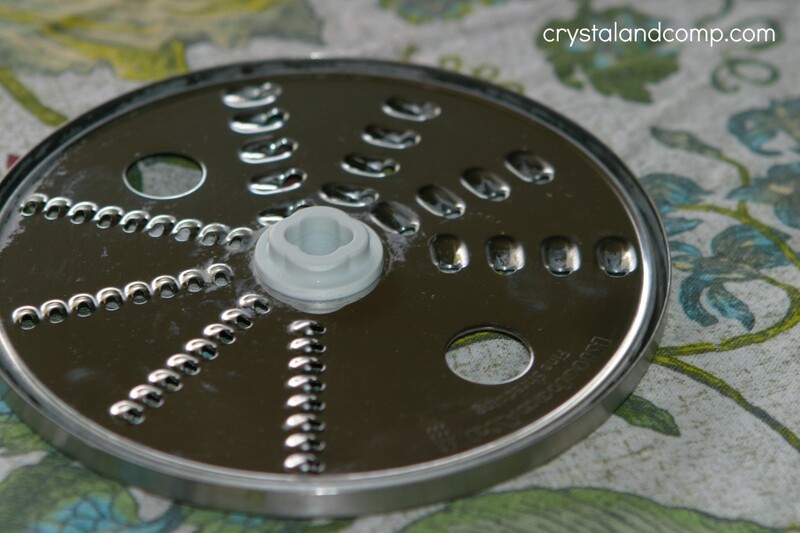 For grating the soap, you can use a hand grater. 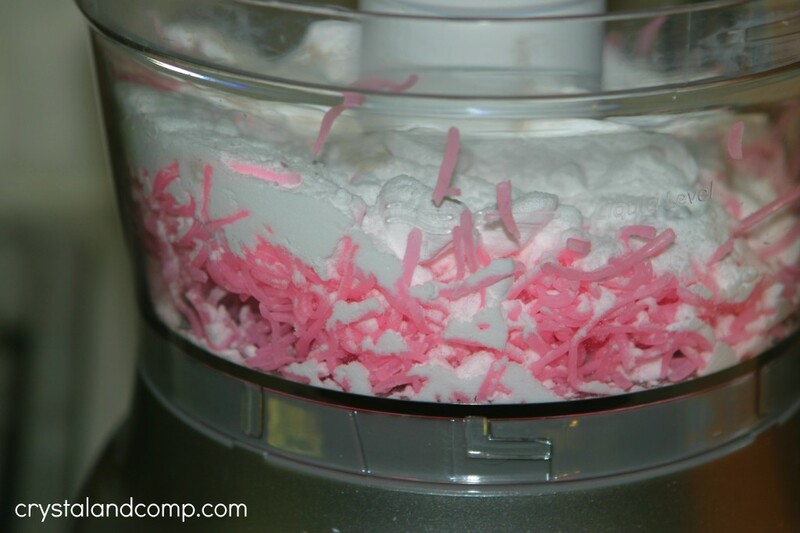 The food processor is also used for finely granulating and combine the soap and all of the baking soda together. If you do not mind large shavings of the grated soap being in your detergent and you do not mind a less fine consistency of final product, I think it would be fine to just manually combine and stir the ingredients together with a large heavy duty spoon. Crystal, I have a front load washer also and I will never have another one! The mildew around the rubber seal has proven impossible, so far, to get off! Ugh! I have a question regarding your recipe for the homemade soap. Your instructions say to put the detergent into the drum of your washer. Was that for front load and top load washers? The small amount of water that a front load washer uses makes me a little cautious about adding the detergent directly into the drum. I have found, after some research, that the powdered detergent works better than the liquid in the front load machines, in helping to prevent the spotting on our clothing. It also seems to be helping to prevent any further growth of the mildew. My front load washer started dropping liquid detergent on my clothes and that was my final straw that pushed me to make homemade powder detergent. I figured a lot of it had to do with the dispenser. I figured if it could not properly dispense the liquid, the powder would get clogged. That is why I opted for just placing it inside the drum, plus others have told me they just place it right inside the drum as well, so I went with that. I am so happy to hear you can do it either way! I am going to try putting in the dispenser. And the mildew/mold smell is hideous! I smell it the most when we travel and I take clothes out of the suitcase. I am constantly kicking myself for buying this washer! Crystal, thank you for the reply! I can’t wait to try your recipe for the homemade detergent. So glad to know that I do have the option of adding the detergent to the drum. I’ve also found that if I allow our clothes to touch the mildewed rubber seal as I am taking them out of the washer, it will cause a crease shaped brown stain on them. I kept finding these mysterious brown stains on our clothes, especially the whites. So I’ve learned to pick the clothes up as I remove them from the washer instead of dragging them out. Also, I try to leave the door open when the washer is not in use to help it dry out. Hi, i have a frount load washer and have had the same problem. This is what i do i admit top loaders are kind of a pain because they require more care . Once a month i clean it with CLR as the directions say. Then i do a bleaching run a half cup of bleach thru a wadh cycle. Then with straight bleach i wipe the insde door making sure i get in all the tight spaces then i wait 10 min, then wipe good with a wet cloth. Run a rince load through one last time wiyj nothing in it so the bleach is gone from the washer as to not have bleash stains on your cloths Leaving the door open is a good idea sounds like u might have hard water? The soap that your making also helps with hard water build up also use a vinegar rince inbetween. The clr and bleaching. Great pointers- thanks for sharing. I will say we plan to never purchase a front loader again once this one totally dies. It has been the most high maintenance appliance I’ve ever owned and it breaks down all the time. I also found that leaving the washer door open reduces the mildew smell and even gets rid of it altogether. I leave the washer door ajar. I do not close it all the way. It will help eliminate the smell. I will also run a cycle of just hot water and bleach about once a month. I hate front loading machines. They don’t get the clothes clean at all. I too have a front load washer. Every 2-3 months I run a cycle with tea tree oil & vinegar to clean my drum & rubber seals. It needs to be a full cycle, nothing else in your washer. I also leave my door & detergent drawer open, when not in use, to allow air to circulate. This has helped a great deal with my washer. I have made my own detergent for a couple of years now. Mine is similar to this one. I have a front load washer and used to have the nasty smell and rubber gasket too. I believe this was due to the liquid detergents that were used building up in the washer. Ever since I switched to my homemade detergent I have never had a bad smell in my machine. I also haven’t had to clean the rubber gasket around the door . Not only is the homemade detergent more economical it also cleans well and does not leave a residue in your machines. I highly recommend the food processor to grind up your soap. A hand grater is tedious and doesn’t get the soap fine enough to distribute evenly. I would look for a used one at a yard sale. I have a mid line Speed Queen…it’s a top loader with no bells and whistles. Life expectancy is 24 years. The warranty is much longer than others too. I love, love, love it. It doesn’t take an hour to wash and it does a super job. The mildew can be gone by leaving your washer door open for at least 30 minutes after done washing to dry it out! Yeah, that did not work for me. We finally put our front loader on the curb….. and now have an amazing top loader. Crystal, I too have a front load washer and the only really trouble I have is the mildew smell. I have not yet used this homemade detergent yet but the one that I use has helped so that our washer does not smell bad anymore at all!! I will be trying your recipe soon hopefully after some more use you too will notice the mildew smell being gone!… Thanks for sharing your recipe. Bethany- I think my washer has a forever mildew smell inside. I even run bleach through it once a week or so on the clean cycle….. no improvement. Yuck! 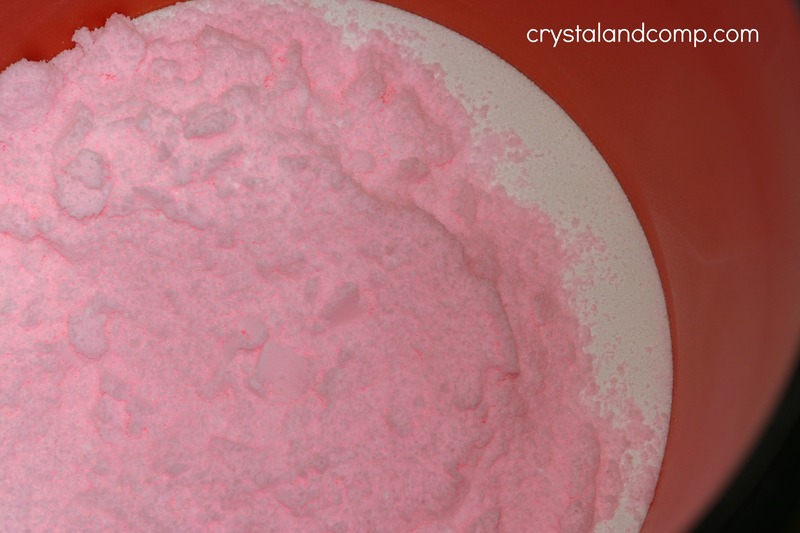 Crystal, I love that your laundry detergent is pink! Thanks for sharing this recipe, I can’t wait to give it a try! Isn’t it fun, Chrissy? And really, it was very easy to make. I will totally be making it again. Have you ever tried making your own detergent? Crystal, I want to say thanks for using photo and good details on the measuring of all the ingredients. I have done the wet version of this and was pleased w the results. I am going to do the dry this time because with the wet I feel I use too much because it’s so easy to over pour.I want to make sure I tell everyone with the wet version I did not have a lot of bubbles and that is the way it’s supposed to be. I want to add I also use 1/2 cup white vinegar to my rinse load because it is a great way to have you clothes soap free. Once the clothes are dry they come out soft and fresh smelling. I’ll never go back to store bought detergents ever. Thank you Bonnie! Glad you found it helpful. Thank you for sharing your experience with the liquid version as well. I know others will find that very helpful. I have an HE front load washer and that is what I am using this recipe in. Crystal, I wanted to let you know that I think I’ve found a solution for the mildew odor in the front load washer. I was drying off after a bath recently, and noticed that horrible smell in my towel. I knew I had just washed and had not let the towels sit for long before they went into the dryer. I remembered a commercial I had seen for Tide Washing Machine Cleaner (I’m not sure that the exact name, but close). I bought some and put it in the tub of the washer and ran a cycle, (without clothes of course;o) After the first use my towels smelled fresh again. I’m going to use it once a week for 3 weeks, then once a month thereafter. I hope this helps you and some of your dear readers. Thank you so much Janet for sharing that. I will have to take a look at the Tide Machine Cleaner. Typically I just run the washer with only bleach on the cycle for cleaning the machine, but I’ve seen some of these cleaners before and wondered how well they work. I use Affresh Washer Cleaner and it works WONDERS! For those of you without a food processor.. I cut my soap bars in half. Microwave a few minutes and it practically disintegrates into little bits. Need to let it cool for a few minutes..it gets pretty warm! What a great tip, Mary. I love that. Thank you so much for sharing! Stacy- I have no idea if that would work, but you might look into the Fels-Naptha Laundry Bar Soap. I can say one of my children has eczema and this does not affect his skin, although his skin condition has improved as he has gotten older. If he was still a baby I would omit adding the scented Downey Unstopables. Absolutely. It is soap, just wash it. I clean it in the sink and then run in through the dishwasher. If there is more soap scum, I run it in the dishwasher a second time. Can I use the homemade detergent in my HE top loading machine? The only thing I have found that I can use is All Small and Mighty. I have to be very careful to use only a tiny bit or I have suds everywhere. This recipe is HE friendly. It only takes 2 T.
According to a friend who is a washer repair person, the components are extremely harmful to the HE machine dispensers, I would be extremely careful with the cost of a repair, I myself made the liquid homemade detergent and put it in water jugs which the material in the soap caused the jugs to become hard and crack, at that time I went back to All Free and Clear, I have way too much money in that machine to mess it up. Just a thought. That’s why you can just add the detergent right into the drum. No need to even use the dispensers anymore. I only use the dispenser for the occasional use of liquid softener for my sheets and blankets. I’ve used my diy detergent in my HE from the beginning and it is working fine after many years a 2 loads a day minimum. With leaving the door open overnight and never shut unless in cycle, I don’t have mildew dis coloring or smell either. I do not use fabric softener though. I just bought a new GE top loader. My other top loader I put this blend in the bottom before I started filling. Has anyone had an issue putting it in dispenser. My new one has a dispenser which I would like to use. It of course calls for HE detergent. Also does an have a solution to run through these washers to make sure detergent doesn’t build up. I have never had a suds issues with this blend. I was researching some recipes for detergent for my front loading machine and came across yours. I am interested in trying it out and think it’s fun that it is pink. I would be interested in checking out out the ingredients to the Unstoppables just to make sure I’m not adding chemicals that are not okay for my sensitive skinned child. As a note for the smell on the washing machine that you and others have discussed. You can avoid this mostly by letting the washer dry out with the door open. Since it is a front loader and needs to seal when closed, the water gets trapped in there with the door closed and you get a mildew smell. Leave the door open for a little while (an hour?) after your done with laundry and the smell will GREATLY be reduced. That being said, you do still get it from time to time and yes…towels will smell like this from time to time regardless of the washer you use. You can use hot water and white vinegar (both on the towels and just in an empty washer) to eliminate this smell. I’ve done it many times with mine and it works just fine. Bleach CLEANS the washer, but will not eliminate that smell – the vinegar will. Just a few tips on the machine there (and I’m sorry yours leaks and all – must have gotten a bad one). Kaye- my youngest has eczema and very sensitive skin. We have had zero issues with this detergent and his skin. You may want to research black fermented garlic for your child’s eczema. It can be a gut issue. This helped a friend’s husband who was not helped otherwise. I dont own a washing machine. You mention only 2 tbs per load. How about on the many size washing machines the laundromat has? If you are using a super large washer at the laundromat, I think 3T would suffice. This detergent is very concentrated and most of the laundromat washers are more like the HE’s washers that conserve water. You need 2 tablespoons, not teaspoons. That is a coffee scooper that I am using which measures exactly 2T. Found it at Walmart for $0.97. Otherwise, just use a tablespoon measuring spoon and fill it twice. you can also use the scooper found inside the Oxyclean too instead of buying a new coffee scooper. Yay!! So happy to hear that. The liquid version just seems so hard and time consuming. 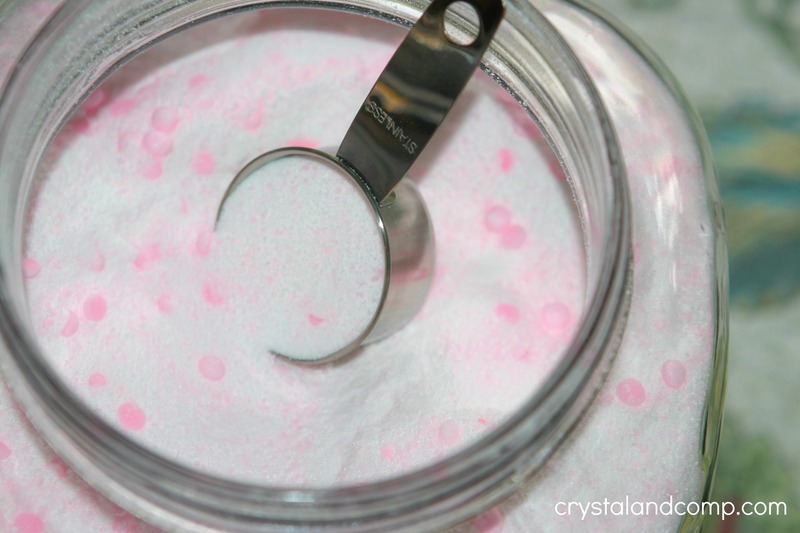 Crystal: I love this idea of making the laundry detergent and am going to try to make it today. I was wondering if this works well in the cold water cycle for washing and rinsing? I use the cold water cycle for almost every load as I have an electric water heater and it gets pretty costly to run the warm water for every load. Do you find that it dissolves nicely or leaves the clumps of detergent behind? Wondering if this works or if I would have to make the homemade liquid detergent. It dissolves just fine for me in cold washes. I really love it. Great. I am going to make this product this afternoon and will update later tonight. I can’t wait to see the results I will get. 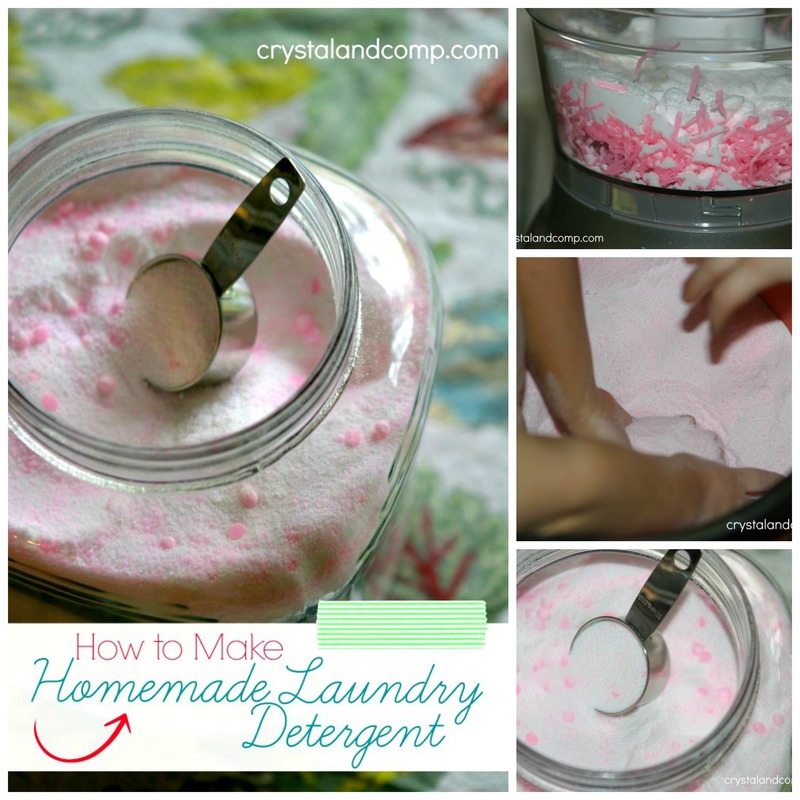 : ) I am also going to try making my own homemade fabric softener. I was wondering if this powder dissolves well in cold water washes? Does it work for H.E. washers? Just made this last night and I am loving it!! Since it has strong ingredients…does it fade clothes over time? Courtney, I have been using it since August and I have had no issues with fading. Where did you get your ingredients? I priced them on Amazon and my total was going to be 54.21. I purchased all of my ingredients at Walmart. I linked to Amazon so you can see what the items look like in the packaging. I always like to visually know what I am looking for. Has this been tried on greasy work clothes? Just wondering how well it works for that? Thanks. Laurie- my husband does heating and air conditioning and climbs through attics almost daily. His clothes come out perfect. Can you use a blender to mix the baking soda and soap instead of a food processor? If I am using pure crystals instead of downy unstoppables, what amount of the crystals do I need? Thanks! Dian- that is a really great idea to use a blender. It would work perfect to mix the baking soda and soap. Thanks! Excited to start saving some money on laundry detergent! I made this last night! I love it!!!! It makes my clothes smell amazing (: Thank you for sharing! I’m going to try this tonight! Do I still need a fabric softener or is that what the Pyrex crystals are for? If you still want to use fabric softener in addition to, you can. The Purex Crystls are softener thought. This is the recipe I use as well but I do 2 bars zone and 2 felt naphtha (7 elementary school aged kids here, and they’re extra dirty!) . I’ve been making it this way for about a year (although I grate the soap by hand and get a sore arm for a couple days). Love it and will never go back to buying laundry soap regularly. I don’t have a food processor, could I grate this by hand? Do I even want to? Also, what else could I use for fragrance — everyone in my house is extremely sensitive to chemical fragrance. We buy natural laundry wash now but 10 cents a load is awesome. You can grate by hand- lots of women do it. If you need to avoid fragrance I would not add the Unstopables or Purex Crystals. You can add essential oils to your soap if you want scent. A couple of drops of oil added when you blend the soap and baking soda together works well. Do this for each batch you blend so that you have about 10-20 drops total and you will have nice smell in bucket but not so much on clothes. My food processor isn’t very powerful. Will that matter? I don’t think the power will matter. You just might want to run it for a little longer…. or until it is well combined. What about cold water wash will it work with that? Yes, works perfect in cold water! I found this recipe online and it seemed so easy, I thought, I can do this! I picked up the ingredients at Walmart, they were regularly stocked items (which is a nice break from some do-it-yourself recipes, where you have to hunt down most of the ingredients). One thing I thought might be helpful to other people making this — I don’t have a food processor, but I do have an electric coffee grinder. Granted, in comparison, the coffee grinder is TINY compared to the food processor. But… it works. Let’s back up a minute. I originally tried grating the soap. Well, I only have a one-size grater, instead of one of those that has multiple sides and multiple size holes. The one I have — the holes are so small, it just got clogged up with the Zote soap. So that wouldn’t have worked for me to just grate it. So I cut the soap into little cubes on the cutting board and put it into the coffee grinder a bit at a time, putting it into a container off to the side once it was adequately shredded. Once all the soap was cubed and then shredded, took a bit of that and added the baking soda and ground that up until I’d used it all up. And then follow directions til you’re done. Now, it is worth mentioning, if you go the coffee grinder route, this does take forever. My coffee grinder kept getting really hot (cause I mean, come on, how many coffee beans would you normally grind at once? it’s not meant for prolonged use), so I had to stop and come back later, and I’m still not done. But… I like the more uniform powder look, and I can get it with my cheap coffee grinder versus having to either buy a food processor or have larger chunks of soap in the powder. So it is possible to do it with a coffee grinder.. you’re just not likely going to be able to do it at one sitting unless you have a commercial coffee grinder that can withstand long use. I haven’t tried it yet, because my washer and dryer aren’t even being delivered for another 2 days. Wanted to get this ready ahead of time, so when the come, I can start right in on washing clothes. But I can’t wait to try it! Love how it smells! And with the ingredients in it, there’s no doubt it should work wonders. I just made your recipe and cant wait to try it. 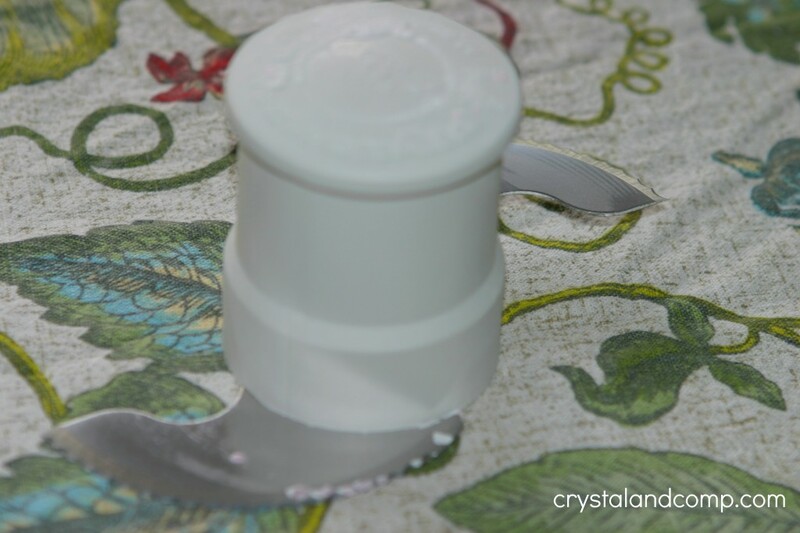 I used the fels naptha but i couldn’t get it to blend like in your picture. Should I use smaller batches of the soap and baking soda??? I loved not having to measure out the borax and washing soda and it makes a nice big batch. I can’t use the Zote because of the smell My hubby has an extra sensitive nose. Where did you get your airtight container that displays your detergent? Love it! Those are Amazon affiliate links. I love to have my clothes smell good!! I use the unstoppables or the crystals and softner. Everyone always tells us they can smell us a mile away. I use extra detergent ever time I wash plus softner and a scent booster! My husband complains about the cost so if this will smell extra good I will surely try. Please let me know! Thanks so much! The detergent itself does smell good, but how do you get your clothes to smell nice? I have been using this detergent, exactly per the recipe, and my clothes has no scent coming out of the washer. I do use fabric softener sheets, mostly because I have a front loaded that makes my clothes smell. That will change this week… we ordered new top loaders and cannot wait for them to come in! Trying using a fabric softener sheet in the dyer. ooh looks good, but i will say that instead of a food processor i saw on another site instead of grating, you can cut the soap into 4 pieces, microwave for one minuet, and the just crumble with your hands, i dont know if it would work but others swear by it, it sus.. softenes so you can crumble it like cheese and then when you put into the other ingred, you just mix it in well and it seperates like the unstopables does. I love this recipe. Been using the same one for years. 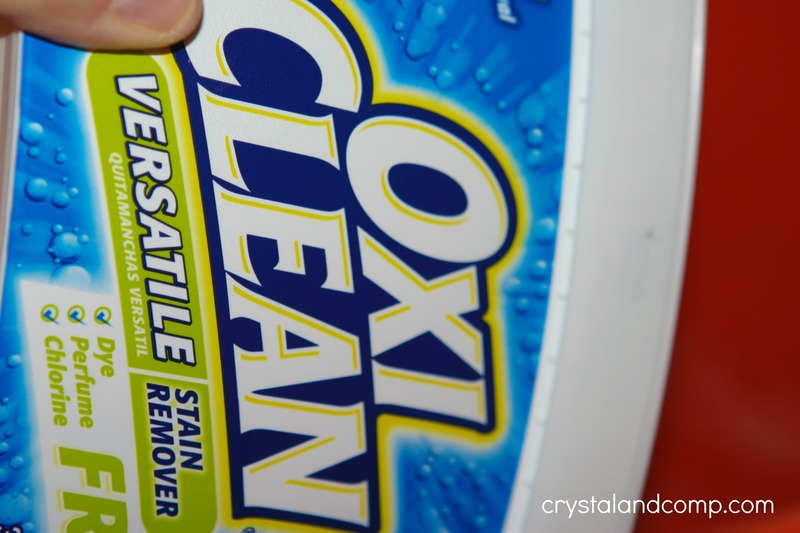 I just use the oxyclean container for keeping detergent near the washer. Along with the scoop. Yes, reusing scoopers in an option! I just wanted to mention that I have been making my own detergent for sometime. I have done some research and I wanted to mention that it is probably not the best idea to be mixing the detergent with your hands. Some of the ingredients can be irritating to the skin. Also, adding plain old hydrogen peroxide to your wash may be a better substitute for OxyClean. There are mixed reviews whether it is completely safe. Just wondering what the baking soda is for in this recipe. It seems like an aweful lot. I have made a similar recipe without it, and it works fine. I have a water softener, and am wondering if all that baking soda would be overkill. Also, you might want to point out that if you are adding Oxyclean to this recipe you should never use it with bleach. I like to make a small batch without it and mark it “bleach safe” for doing my whites. I have an HE washer and have never had any issues with a mold smell. I have always left the door open on mine when not in use, and I even take out the drawer to allow it to completely dry. Running the clean cycle every month will help too. Baking soda helps dissolve dirt and grease while softening your clothes. It is also great for removing odors. Baking soda also works to softens the water if hard water is an issue. Remember, you’re only adding one coffee scoop of the entire detergent to one load of laundry. So the amount of each cleaner is minimal and effective. I wanted to add, this entire batch will do 271 loads of laundry. Although I love it, I have noticed this detergent isn’t very good at removing strains. Any advice? A good pre treatment maybe? Hey Crystal, it is an inexpensive and Eco-friendly detergent making process which I have to consider making for my washing solution. I heard that, vinegar is the solution which can be use as a softener of hard water. It is the simple and unique way to remove the stains from the clothes. 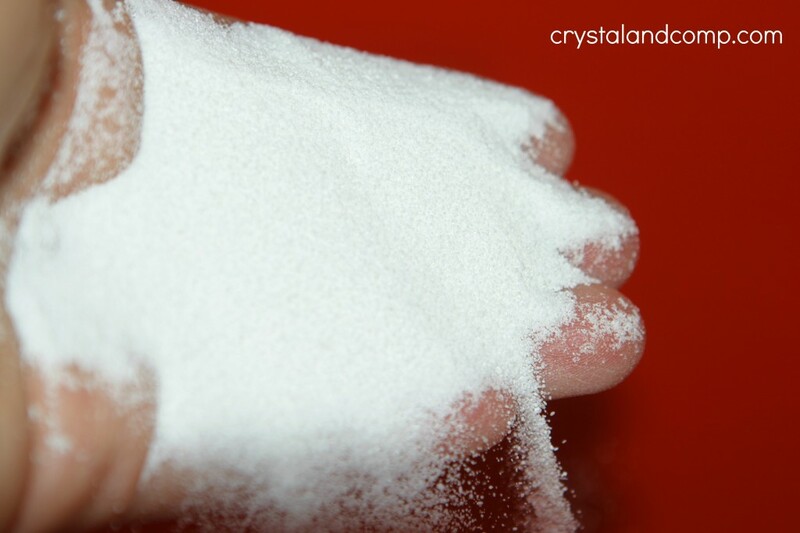 Thanks for sharing the great method of detergent powder. Hello! I just made a batch of this detergent and I’m excited to give it a try! I my only complaint was because I hand-grated so my arm got tired. I hate grating. 😉 I made it, my husband asked if he had to do anything special with it, and I said nope! I left out the Unstoppables because my son has sensitive skin to fragrances so I’m hoping this is fine for him. Thanks so much for the recipe! There are differing sizes with the Unstoppables and the Purex Crystals. I think the Purex Crystal’s provide a stronger scent, likely because it is a larger container. If you like less scent go with something smaller like the Unstoppables. Or, you can go for no scent at all. I have a question. Have you noticed it fading your clothes? I made my own (but liquid form) and even my husband noticed our clothes were fading. I saw today at my local walmart that the Zote soap comes in a flake form! Anything to make it a little easier! I have seen that too, but have not tried it. Super exciting! I use this same recipe but I cut the bars of Zote into quarters and microwave each one separately in a large baking dish, 60 seconds at a time, until all the moisture evaporates. (It blooms like a marshmallow) Once the “blooms” cool completely I run them through the food processor to make a fine powder, then mix with the other ingredients. I mix in doubled plastic trash bags tied off with a hair elastic. Then roll the bags around on the kitchen island till the powders are mixed well. Grating with a hand grater and shaking a 5 gallon bucket full of laundry powder is more than my joints can handle!! Can I use a blender to substitute the food processor? Yes ma’am. I don’t see why that would not work. You just may want to mix in smaller batches. I plan to try this recipe. I have read that you can use essential oils to add fragrance. I see a lot of comments about mildew problems in front load washers. It is recommended that you never close the door. Simply leave it slightly open and you will not have mildew as it is caused by no air circulation in drum after washes. You can add essential oils! What is this comparable to? Does it fade my the clothes? What do you mean comparable to? It is better than any detergent I’ve ever used. It has not faded my clothes. I’ve been using it for over a year. I do not have babies anymore, but if I did I would certainly use it on them. I use it on every load of laundry in our house. I have used it with mixed good results. I use clothe pads ( my sons old soaker pads) and it doesn’t take out 100% of blood stains, it does most of them. Also no chemical itch using them. Soakers are now 18 yrs old and used for probably12-15 of those years. 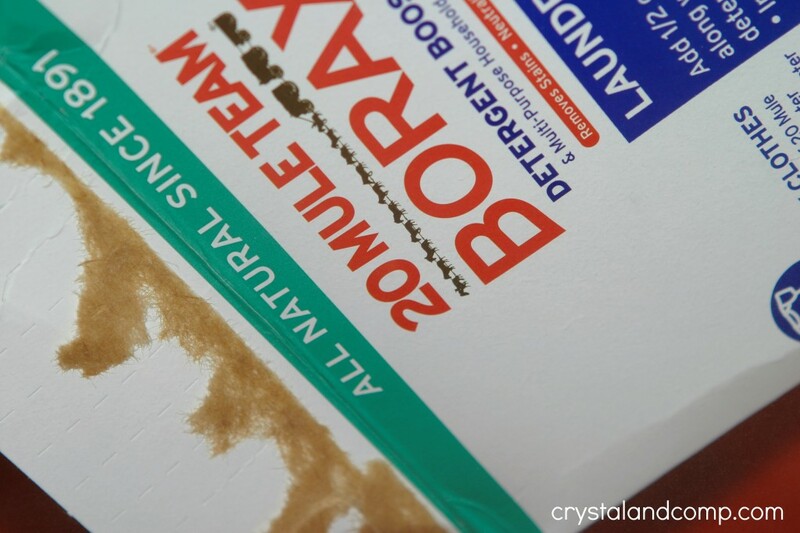 I also use clothe wipes and it does remove all #2 stains so wipes come out spotless. Cheap polar fleece blankets cut to square make fantastic shakers when folded or wipes left flat! IS the soap HE safe for the front loader washing machines? I use it in my front loader every day. 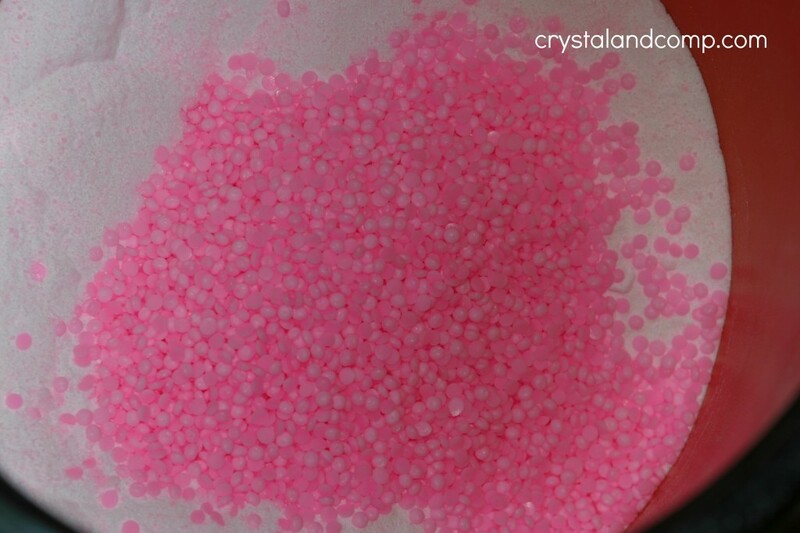 Has anyone used the Gain scent crystals and how did it turn out? I have not used them yet, but I bet they would be great! I have an HE machine, top loading and I would be so afraid to put powder down the little dispenser hole on this machine. It’s a Whirlpool and can’t wait for it to stop working. (Now that I think about it, maybe using the dispenser would help me out 🙂 ) My question is, do you put the detergent directly on the clothes and then start the wash? My machine puts the clothes in and locks, then starts working. (Did I say I HATE this washing machine???) Thanks for the information. I so want to make up a batch of this and try it. I have done both- putting it in the drum and putting it in the dispenser. What I have learned is that putting it in the dispenser seems to be best because the water pushes it through to the clothes and in my head I think that is better. Do it which ever way you think works best. Hello there! Thank you so much for sharing this recipe with us! I’ve been search high & low for months to find a recipe I thought I’d like. And FINALLY! I stumble across this. Only thing is, I’m not a big fan of Oxi-Clean. Is it necessary to include? Or could you recommend a substitute? Thanks so much!! Yay! Glad you found this! You absolutely can omit the oxi-clean or sub out another similar product. I have been thinking about doing this for over a year now. Well, about two weeks ago, I finally did it. My hubby even helped me. He was fascinated that we could do this. It was super easy. For those of you that have been putting it off, go ahead and try it. I haven’t had any problems with too many suds in my washer and my clothes come out clean and smelling great. I used Gain scent crystals in mine. This stuff is great. Thanks for the recipe. I use it in mine daily! Good question. I have no idea how they would react to each other… the ammonia and oxi-clean may not work well together. I have been using this recipe for about 2 years now and LOVE it. BUT I recently have been noticing that ALL of my cloths are starting to show little pinholes and frayed edges on the seams of my shirts. Do you have any suggestions? Can this be made into a liquid? If so, how do I do that? At this point I do not have a liquid recipe but will research to see what I can create. This recipe was the first try at making my own detergent and I’ll never have to try another. This bears every commercial detergent out there in every category. I have tried different scent boosters just too see which I like better. So far Downy Unstoppables and Gain pink Fireworks are tied for first! Thanks for sharing, great tutorial. It turned your wash orange? As in the clothes? What did you wash… I’ve never in my life seen this. The only fragrance will come from the Zote soap, which is mild, or the softener crystal’s that you add. You can choose not to use the softener crystal’s. You can also replace the Zote with Ivory bars if you like. I used a similar recipe for a few years and loved it… Initially. Then I noticed all my whites became increasingly dingier and dingier looking. Nothing I could do made it better, so I eventually quit making my own. Every recipe I’ve seen has been used by the author for a year or less, so it makes me wary of trying it. Any issues with that? I have been using this recipe for 2 years and I’ve not had issues. We really love it. i make this and love it. it will not make suds. i do not use the bars of soap and my clothes areclean. 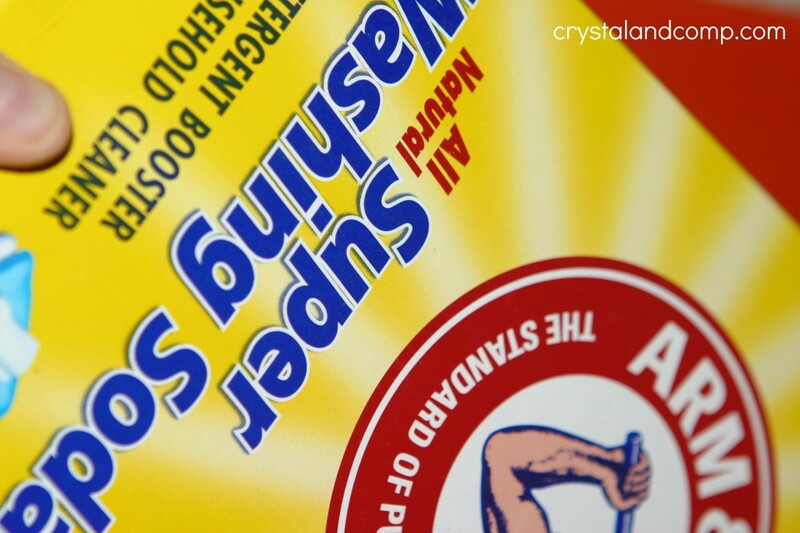 for stains use hydrogen peroxide and a drop of blue dawn and a toothbrush. then throw in the washer. this is a keeper. have een doing this for 5 yrs. They carry Zote soap here in the states at many grocery stores. I have seen people also use Ivory soap bars with success. You could always order from Amazon. Egar to try this out! However,Can you use this with bleach? Or will I not have to use bleach anymore? I use it with bleach when I do a load of whites. Thank you!!! Going to try it out this weekend! Is the small bottle of Unstopables enough to smell a lot? I like our clothes to smell pretty strong when they’re cleaned lol. Also, do you still use a fabric softener? If you like it strong use a large bottle of Unstopabables. Can it be made without unstoppables & Oxyclean to have less chemicals in the finished product and still be an effective laundry detergent? Yes, you can forgo the Unstopptables. The Oxyclean just adds more cleaning power. I would say 4 to 6 months. I used it in my HE, but its up to you. 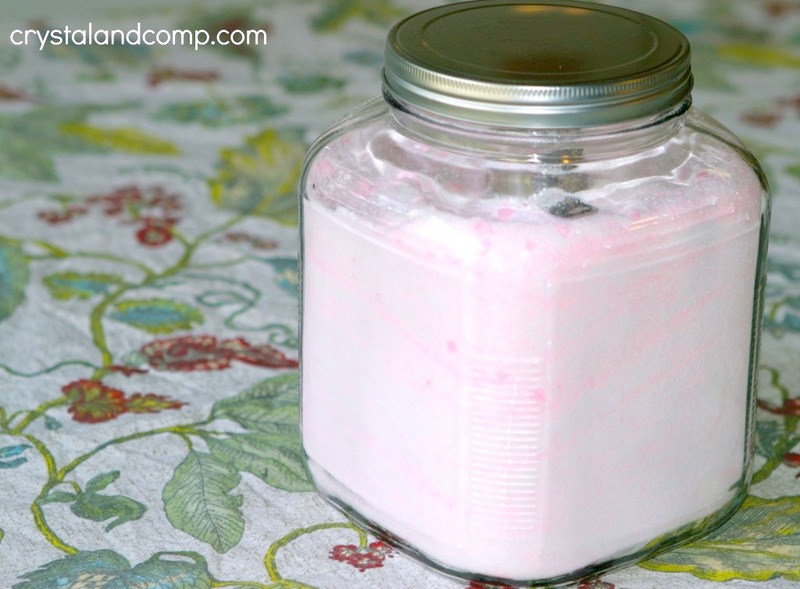 I really love this homemade laundry detergent! I made a few changes to the recipe- I replaced the Zote soap with 3 (5 oz.) Dr Bronner’s Unscented Pure-Castile Bar Soaps and used 2 (14.8 oz. bottles of Downy infusions Amber Blossom. You can also purchase a box of Downy infusions Amber Blossom fabric softener if you prefer. Also, I added l tbsp. of Kosher salt to the wash to keep colors from fading- not necessary, just my habit. I will be making another batch of your recipe with a friend and we will be using Downy infusions Lavender Serenity, another lovely scent. want to try yours. Since I cannot find any brand of castile soap here, I am wondering if I could use Sunlight bar soap. Says it is pure for 100 years 2 x 130 g.
Are the ingredients natural products — no chemicals. I am going to keep trying to find castile soap in a bigger city. Thanks for your help.